For pages, folders, images and files. Need to re-order a menu? See Menus and Breadcrumbs instead. 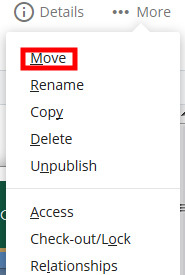 Navigate to the asset/page/folder that you would like to move. Click More in top right corner and select Move. Under "New Folder," click to choose a new location. Browse and select the new desired folder location for your asset/page and click Choose. Publish your site to ensure all menus are properly updated. Click and drag an asset in your file tree to the new desired location in your file tree. The Move screen will open to verify the New Folder location you have indicated. Click Move to confirm (or Cancel to abort).